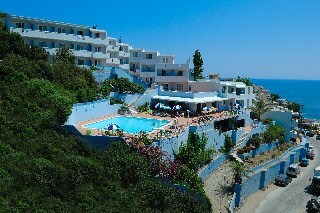 The Bali Beach Hotel can be found overlooking the stunning coastline of Bali, a small fishing town in Crete. Here you can enjoy the wonderful scenery as well as the lively atmosphere and array of rustic restaurants, cafes and shops offering the perfect taste of local island life. Rooms are modern and well designed and the hotel has a relaxing and idyllic feel to it. Staff are happy to help you arrange excursions and plan trips and you will find the in house facilities will allow you to have an unforgettable trip.Rooms at the hotel come with plenty of light, storage space and modern amenities. You will find soft furnishings and stunning views from your bedroom window, all rooms come with comfortable beds, en suite bath or shower, Satellite TV with music channels, mini-refrigerator, air-conditioning, safety deposit box, direct dial telephone, hair dryer, balcony or terrace.